I won't pretend to know anything about the Assassin's Creed video game series or, for that matter, much about video games in general given the last one I played was probably Crash Bandicoot on the original PlayStation circa 2001. This is to the point that I'm typically indifferent to the idea of video game to film adaptations especially given most tend to be financial failures with the few I've seen being rather forgettable as well. 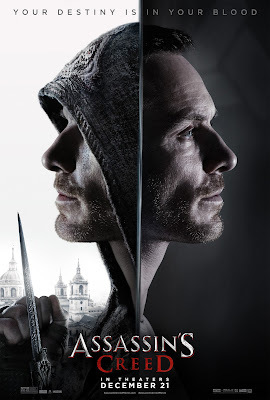 It is with this Assassin's Creed adaptation though that my interest was piqued as not only had it attracted Michael Fassbender to star in another potential franchise, but that it also gave Fassbender cause to recruit his Macbeth director, Justin Kurzel as well as cinematographer Adam Arkapaw, it felt as if there might be a chance to break the mold. Despite the fact Kurzel somewhat shortchanged Shakespeare's story he indisputably made a visually stunning representation of The Bard's play and with Assassin's Creed coming from a medium very much based on the visual storytelling element it seemed as if this was a logical choice and that both Kurzel and Fassbender were very much intent on keeping the same visual style intact. That's what Kurzel does best, that's why Fassbender imagined he would make a good fit. They do, but the fact the visuals the film offers via its flashbacks to Spain in 1492 aren't the highlights of the film speak to how much better this is, but still how much better it could have been. Granted, the sequences in Spain are certainly the most breathtaking in terms of visuals and contain well-paced and seemingly well executed action sequences, but they aren't developed nearly as much character-wise as the other sections of the film. This is all to say there is an interesting premise here. Like I said, going into the film I had no idea what the objective of the game was or even who or what the titular assassins or their creed might be, but as we get to better know Fassbender's Callum Lynch (a character apparently made up specifically for the movie) we come to better terms with this world that three screenwriters have seemingly cobbled together from what I assume are the most interesting parts of the game. Faithful or not though, Assassin's Creed, the film, is an average enough action flick that has a core idea it certainly could have done more with and in more interesting ways, but takes shortcuts around the deeper questions posed by its central premise while hoping to garner enough return so as to potentially explore such questions and ideas in a sequel that will likely never happen. Prisoner Callum Lynch (Michael Fassbender) is needed by Sofia (Marion Cotillard) due to his ancestry in Assassin's Creed. This is frustrating on many levels as it's not often we get a major studio, big budget action movie that has as much potential story-wise as what Assassin's Creed presents. That the film chooses not to put all of its eggs into this initial basket though, is a mistake so many supposed blockbusters make these days as they hold out hope for a franchised future; most of which never see the light of day. Again, I have no knowledge of the video game though some quick reading will tell anyone that the game series is set in a fictional history of real world events and follows the centuries-old struggle between the Assassins, who fight for peace with free will, and the Templars, who desire peace through control. With Kurzel's Assassin's Creed it seems the intent was to establish a leading hero in Fassbender's Lynch so that we might have a figure to follow in the presumed sequels, but the arc we see Lynch as well as his ancestor Aguilar take would suggest that if we were to follow Lynch in future installments we would also not be allowed access into the past again as Lynch has become a part of the modern group of Assassin's that defend the world from this organization of elders who dictate the constructs by which society conducts itself. This is an issue due to the fact the most interesting part of the story is this idea of a large, shadowy organization mining people for their ancestors memories. I won't allow this review to make the same mistake as the film though and spend a large amount of time discussing what could/should have been or what might come, but rather what we have here in front of us now. 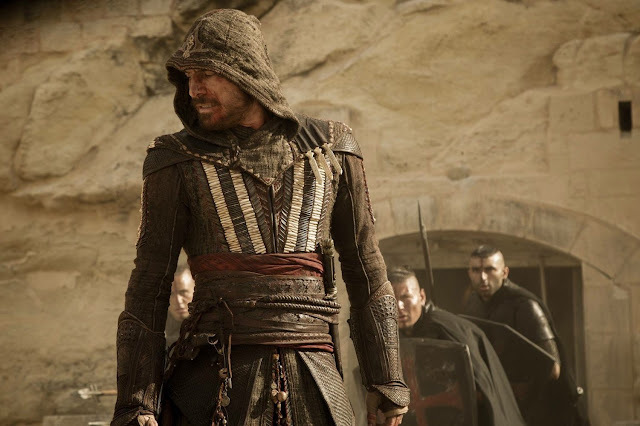 Justin Kurzel's Assassin's Creed began by making me think it would be a film very much in line with what has come before it in terms of video game movies by delivering a title sequence followed by aerial shots backed by a generic rock soundtrack that screamed cheap. It seemed to tell the viewer all they needed to know in terms of tone and ambition very quickly, but then things began to shift. It goes, at quite a fast pace, from this more corporate mandated feel to something more personal, more of one mind. We see a young boy come home to find his mother has been murdered (the music already drastically different) with his cloaked father standing next to her. The sirens of police cars roar in the background with the father telling his young son to run. Fast-forwarding thirty years we see that young boy has grown to be Fassbender's Lynch and that he has landed in the same place his father presumably did and on death row. We watch as the lethal injection is dealt, we are shown the onlookers who seem to be getting some kind of vindication from this sight, and then we see Lynch wake up from a sleep he should have never awoke from. It is through this set up many a questions are obviously posed and I don't care to short change the effectiveness of what Assassin's Creed accomplishes simply due to the fact it's a movie that purports to be very obvious in the type of movie it is. Yes, the films central conceit of positioning Jeremy Irons as the two-faced bad guy posing as someone who wants to cure the world of violence only as long as he's in power when it's cured and happens to pick up priceless artifacts along the way is rather silly. There is more complexity and shades of strong moral and ethical questions to be dealt with here rather than simply positioning the antagonist as someone who acts as if they want to do good so as to make the lines between good and evil seem that much grayer. We are clearly led to believe the creative team here is on the side of the Assassin's and we pretty much are throughout as well, with only a slight hesitation in the beginning for non-gamers as I, personally, had no idea what exactly was going on for the first twenty or so minutes of the film. Thankfully for the uninitiated, Marion Cotillard is here to relay exposition as she portrays Sofia, the daughter of Irons' Rikkin and the creator of this technology known as the "Animus Project", that allows Lynch to relive Aguilar's genetic memories so that Rikkin may finally locate the whereabouts of the Apple of Eden. There is a measured amount of ridiculous dialogue dedicated to the idea this Apple of Eden apparently contains the genetic code for free will and will thus cure the world of violence, but this main objective isn't so much what matters as is the way in which the film makes us invested in the journey despite the fact we care little about the outcome. There doesn't always have to be this grand plan or prime directive that the bad guys are trying to execute and the script for Assassin's Creed seems to include one of the more ridiculous excuses for such a scenario simply for the sake of such a scenario. Rather than focus so much on Irons' almost unnecessary character, never mind the pointless appearance of Charlotte Rampling, and rather allowing the film to breathe in seeing Lynch coming to understand the possibilities that exist with Sofia (who really does have her heart in the right place despite her parentage) and her Animus project and how such experiences might help him to better deal with the inevitable reunion with his father (Brendan Gleeson) we might have had something both streamlined while stimulating. Rather, by becoming too caught up in the familiar beats of good overcoming evil in order to set up a sequel Assassin's Creed inadvertently is too distracted by its contemporaries to become what could have easily been its own unique thing. Aguilar de Nerha (Fassbender) fights against the Templar Order as part of the Assassin's Brotherhood. All of that said, the most curious question I had going into this latest video game adaptation was what might draw a talent like Fassbender to star in another potential franchise when he seems to have been doing less and less with each passing X-Men installment. As the film progresses it becomes easier to see the attraction for an actor to this lead role. Given they are playing two different people that are distantly related-one going slightly crazy, the other an action hero with the added caveat of the two somewhat melding together the allure of the challenge is obvious when it comes to someone such as Fassbender who signs on for roles in movies like Shame and 12 Years a Slave. There is a challenge to the portrayals and small differentiators that Fassbender must embody when it comes to portraying Lynch as well as Aguilar. The two men have strikingly different mentalities upon first meeting them-Aguilar taking an oath to be a part of the Assassin's whose creed more or less states that their own lives are nothing if not for the greater sake of civilization whereas when we meet Lynch shortly after he is pronounced dead what we have is an aggressive prisoner who seems unwilling to allow any other opinions, interpretations, or ideas other than his own to enter his mind. In a movie more in tune with what makes it unique Fassbender might have been given a real opportunity to compare and contrast these two figures as the story ultimately wants to allow these ancestors to finish the fight those that opposed them are determined to carry on, but Assassin's Creed ultimately capitalizes only on the action in the flashbacks despite the weapons admittedly being cool and the quest compelling while the modern day sections largely exist to explain how and why we're seeing what we're seeing in the past. That said, the exposition Cotillard is tasked with spewing gives these modern day portions of the film opportunity to present compelling questions such as: does re-living the lives of our ancestors help us better understand who we are? Are those with a history of it born with a pre-disposition for violence? How does the Animus combat aggression by allowing its subjects to exude it? Even the idea of man's first disobedience being free will, which would have proven a valid theme, is reduced to a plot device. Assassin's Creed damns humanity for being content with following, boasting that notions such as freedom don't really matter anymore, but this is a film that were it to practice what it preaches might have been something truly innovative if not at least fun and rather unique, but as it has now been written Assassin's Creed is a film that is mostly entertaining, but totally routine.